Gloucester High School Principal Erik Anderson, center, is surrounded by winners of the 2015 Sawyer Medal and other awards following a ceremony Wednesday evening at the school. 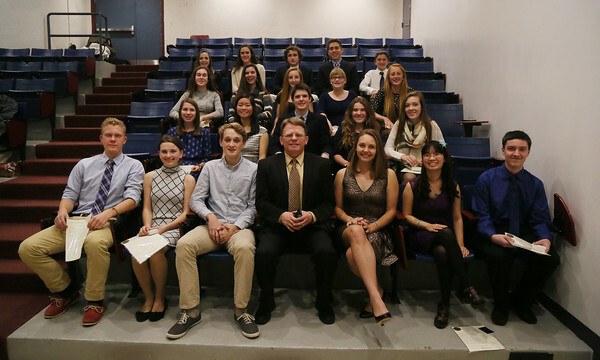 In the front row are, from left, Sawyer medalists Lukas Struppe and Cara Stockman, both seniors; Noah Stevens, a senior who won the College Women's Club of Cape Ann Award for academic achievement, a Letter of Commendation for Outstanding Performance on the Preliminary SAT/National Merit Scholarship Qualifying Test, and the state Association of School Superintendents Certificate of Academic Excellence; Anderson; senior Matilda Grow, who won the Harvard Prize Book award for academic achievement and the state Association of School Superintendents Certificate of Academic Excellence; and Sawyer medalists Julia Butler and Kevin Nolan, both juniors. Second row, from left, are sophomore Sawyer medalists Lexi Zubricki, Soo Ae Chiharu Ono, Henry Hardy, Caroline Enos and Danielle Larrabee. Third row, from left, are freshman Sawyer medalists Lauryn O'Connor, Rebecca Dowd, Jemima Grow, Marisa Orlando and Tracy Wood. Fourth row, from left, are freshman Sawyer medalists Carolyn Cinelli, Diane Story, Caleb Willett, Rodney Nyborg and Maxwell Boucher.